This guy puts the “suicide” in Suicide Black. The trick, of course, is that if he attacks when he’s face-down, you don’t lose life, and you can turn him face-up mid-combat. In Onslaught drafts, that is actually surprisingly good, as there are plenty of dangerous morph creatures (Skirk Commando and Silent Specter et al, and obviously all the way up to Exalted Angel and Hystrodon) and your opponent can only really guess what each one might be until they turn face up, and may not be able to risk not committing to blocking. Unfortunately, although a successful hit from him shortens a game significantly, it can never end one outright; in addition, he had to share Standard time with crazily good black creatures like Psychatog and Shadowmage Infiltrator, so he never made much of an impact in constructed. His prospects in competitive play aren’t so good nowadays either, but I do like the idea of a casual theme deck where all the creatuers have morph and your opponent will feel bad about blocking vanilla 2/2s or casting Terror on them – but also can’t afford not to. Ebonblade Reaper represents an interesting puzzle: a powerful effect with a substantial downside. Halving your opponent’s life total on a successful hit can do a lot of damage…but you lose half of your life to start the attack, and it’s a 1/1 with no combat abilities or protection. That’s where Morph comes into play, Onslaught‘s flagship mechanic; you can play this as a 2/2 face-down and then turn it up when the time is right, doing damage as Ebonblade Reaper instead of as a nameless morph creature. It’s 8 mana over two turns to pull it off, but it can be a massive hit of life for a single go. And given how morph was done in Onslaught (creatures could be anything), the dearth of information can force weird blocks if they’re afraid of what’s to come. 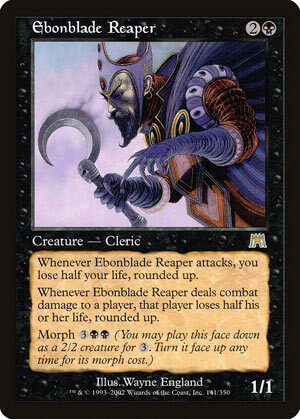 Also, Ebonblade Reaper is a Cleric, one of Onslaught‘s more well-supported tribes. So that’s a thing, I suppose.